The LovEvolution and the Magic Love Bus roll on. There is a quiet revolution spreading around the world that is rippling out from the hearts of millions to create a sea of change. It’s a revolution of evolution through love [more]. 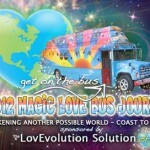 During the summer of 2012, the Magic Love Bus invited people to "Get on board for the LovEvolution" as it crossed North America from from San Francisco to Asheville, North Carolina. The Bus was a platform for sharing ideas, healthy food, music and love. To see highlights of the 2012 Journey click here. Event Schedule for the 2016 LovEvolution Gathering. Diving into the Dance of Love and Life.